Only a few QBs can make that play. Great play by Luck, stepping up there. He's playing a smart, controlled game. #Patriots pass rush has improved but now, Luck is getting away from pressure with ease. Give Chuck Pagano credit. Colts came to play tonight. Wait until Andrew Luck knocks off the rust. That's some Aaron Rodgers ish right there. Like, for real. A-Rod is probably the only other guy who can make a play like that. Who am I forgetting? #Colts defense is so focused on Rob Gronkowski, slot receivers are wide open. Definitely not how they drew it up. The Colts had Julian Edelman stopped in the backfield and then he hit the "B" spin button to get the first down. First flag of the year on Vollmer. Jeez. Looked like Pats were just looking for FG range there. That was designed to just get some of it back for FG position. Amendola made it possible to try for 7 a couple times here. Colts had the Pats in 3rd and 17 and they still gave up the first down. Can't miss out on those opportunities. 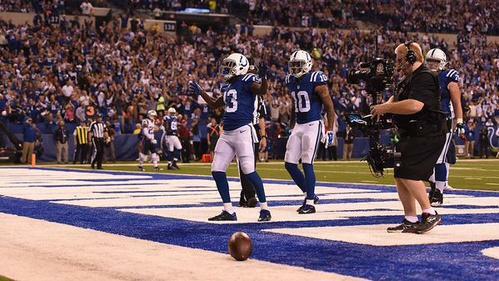 Greg Toler has been brutal. It started back in the preseason against Philly. Sheesh. This is something else. Massive swing there on that call. Soft, if you ask me. If Chandler's hand goes anywhere but Toler's face, that's a bad call. But it went to Toler's face. So, good call. Gostkowski 12-for-12 on FGs this year. I probably don't throw that flag. Borderline.